Lavender essential oil is one product I routinely recommend as a staple in one’s medicine chest. This small vial of essential oil, (as opposed to perfume oil), can provide relief to many common complaints, and can even be relied on as first aid in certain situations. Lavender essential oil is distilled most often from Lavendula angustifolia, or “true” lavender, which distinguishes it from hybrid varieties. Like all essential oils, lavender is primarily used as a topical remedy, and not intended for ingestion. It should be kept out of the reach of children. Lavender essential oil has anti-inflammatory and antispasmodic properties, which make it an excellent headache remedy. Simply apply a few drops to your fingers, and massage into the affected area. Essential oils are usually diluted in a carrier medium, such as vegetable oil or water, to make them less potent and appropriate to apply to the skin. 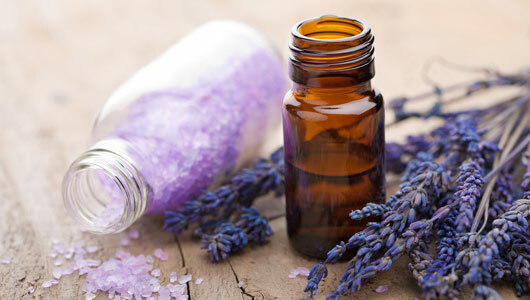 Lavender, along with patchouli and tea tree oil, is among the few oils that can be applied directly to the skin in small amounts, also referred to as “neat” application. Its anti-inflammatory properties also benefit skin conditions like acne and rosacea. Like many essential oils, lavender is also antiseptic, and also stimulates new skin cell growth. The combinations of these three properties make it one of the best remedies for first- degree burns, including sunburns. Lavender has actually been employed successfully in intensive care burn units. For simple burns, apply a small amount of the essential oil directly to the burn, and then re-apply three to four times a day to lessen the pain and aid healing. For sunburn mix about five drops of the oil to an ounce of aloe Vera gel and apply liberally. This greatly reduces unsightly peeling of the skin that follows sunburn. Lavender is an effective, yet gentle sedative. A simple remedy for restless sleep is to place a drop or so of essential oil on a cotton ball and place on the nightstand. The subtle odor will calm and relax, and ensure a deeper sleep. Lavender has been compared in sleep studies with certain pharmaceutical sleep aids. It was found that lavender was equally as effective, without the negative side effects associated with the medications. Using lavender in conjunction with massage will enhance the benefits of the massage. This is true for all essential oils, provided the oil used in pleasing to the recipient. Lavender’s anti-spasmodic and sedative properties combine to make it a favorite choice for overworked muscles. It is not simply the scent of lavender that conveys therapeutic benefits, although this is certainly part of its appeal. Essential oils have a small molecular structure, which make them readily accepted by our bodies. Regular use can yield subtle, yet profound results on our mind and body.